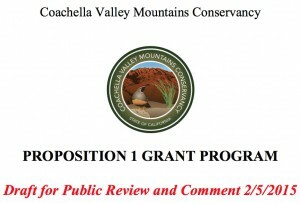 The Coachella Valley Mountains Conservancy (CVMC) has posted a draft edition of its Guidelines for the Proposition 1 Grant Program for public review and comments. 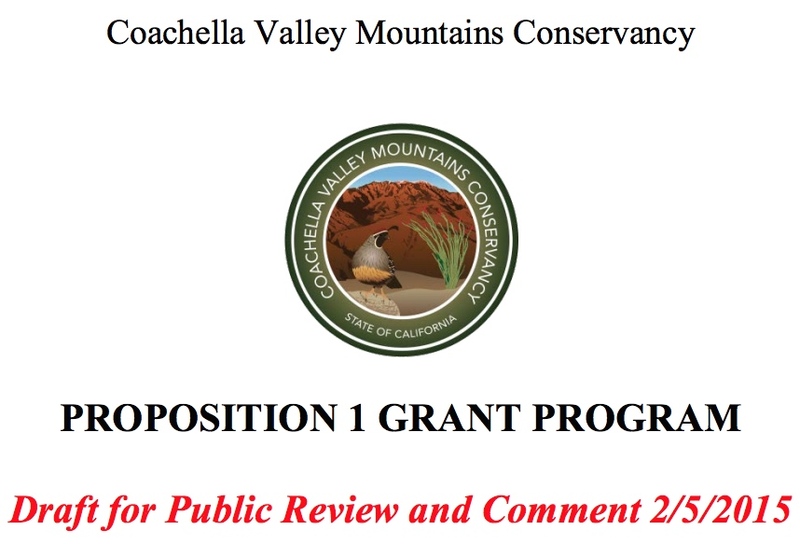 The Guidelines draft may be viewed here in its entirety and the public is encouraged to be involved in the process through which the CVMC is working to protect the natural and cultural resources of the Coachella Valley and its surrounding mountains, which include the San Jacinto and Santa Rosa Mountains National Monument and portions of Joshua Tree National Park. 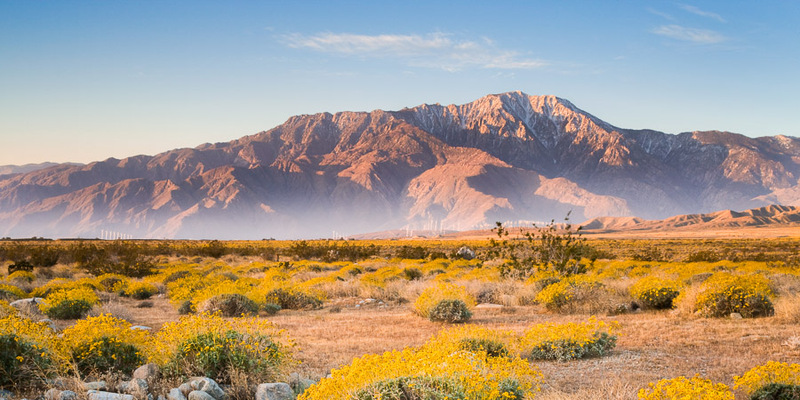 The Guidelines will be the subject of several public meetings, the first being a hearing at the Conservancy Board of Directors meeting at 3 p.m. on March 9, 2015, at 73-710 Fred Waring Drive, Suite 115, Palm Desert, California. Other meetings will be held around the Conservancy’s territory on future dates to be announced on this page. Interested members of the public may provide comments verbally or in writing at one of the Conservancy’s public meetings, or by letter or email to Jim Karpiak, Executive Director, 73-710 Fred Waring Drive, Suite 112, Palm Desert, CA 92260, or by email to jkarpiak@dc.rr.com. If you have any questions, please email or call the Conservancy’s offices at (760)776-5026.